7.Special hanger design enables to fix the lighe variously, especially no Watt limit the client can assemble it per their different requirment and realize extensive assembly. 8.Luminescence degreed is 10 times than the existing grow light, luminous efficiency stably, saving more energy. 9.The light and power is connected by the waterproof stack plug to make fix & debuging easily. 10.To do malfunction diagnosis and maintenance easily. 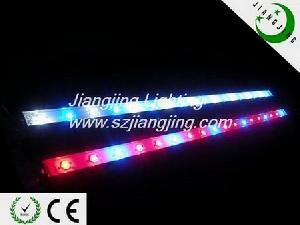 11.A illumination source safety ensures LED working normally even some LED failure. 12.Smaller size is easy for transportation. 13.The client is permitted to set the different light proportion. And we advise 8:1, 7:2, 2:1 & 1:1 for the red and blue.